South African mother Tania Clarence, who admitted to killing her three disabled children while they slept, has been allowed to return home. She pleaded guilty to manslaughter on the grounds of diminished responsibility and sentenced by a judge to be held indefinitely in a secure psychiatric hospital. 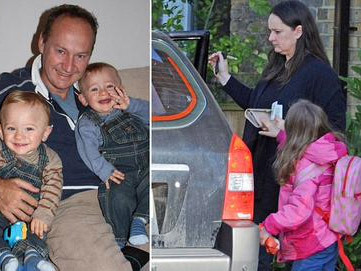 Tania smothered three-year-old twins Max and Ben and their four-year-old sister Olivia while they slept in their beds in New Malden, South West London. The three children suffered from a terminal genetic disorder, the muscle-weakening condition MSA type-2. The court found Tania's actions to be a product of her mental illness. After four months in hospital, Tania was pictured outside the R20 million home in , carrying a suitcase. The UK's Mirror reports she has been allowed to return home on weekends to spend time with her surviving daughter. Tania's husband Gary, an investment banker supported his wife throughout the emotionally charged trial. He and the couple's eldest daughter were on holiday in South Africa when his wife killed their three children. Their bodies were found tucked into bed, with their toys arranged around them. Tania then tried to kill herself. "Her daily struggle eventually overwhelmed Tania’s ability to cope with the ­enormity of the task she faced," the family lawyer Richard Egan said in a statement after Tania was sentenced. "Ultimately her story of dedication and love became a story of despair and utter hopelessness. "The loss of the ­children’s lives at the hands of their mother who ­cherished them is a tragedy explained by her severe depressive illness. But it is also a tragedy from which lessons need to be learned. "Tania’s depression was certainly not assisted by the constant pressure placed on the family by some individuals within the medical ­profession and social services." Justice Sweeney, who presided over Tania's case, told her: “The prosecution accept you loved all four of your children.